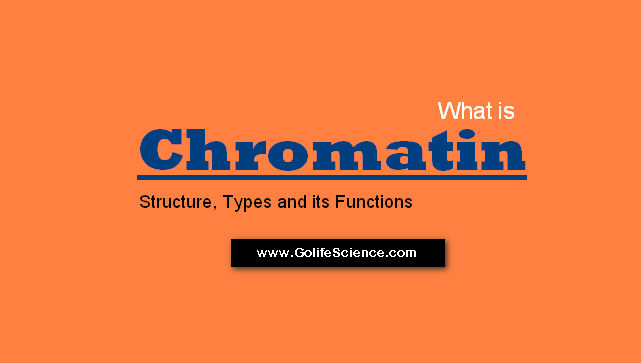 Chromatin : What is the Structure, types and Functions? Chromatin is the combination of DNA and proteins that make up the contents of the nucleus of a cell. The primary functions of chromatin are: to package DNA into a smaller volume to fit in the cell, to strengthen the DNA to allow mitosis and meiosis and prevent DNA damage, and to control gene expression and DNA replication. The primary protein components of chromatin are histones that compact the DNA. Chromatin is only found in eukaryotic cells. Prokaryotic cells have a very different organization of their DNA which is referred to as a genophore (a chromosome without chromatin). The structure of chromatin depends on several factors. The overall structure depends on the stage of the cell cycle, during interphase the chromatin is structurally loose to allow access to RNA and DNA polymerases that transcribe and replicate the DNA. The local structure of chromatin during interphase depends on the genes present on the DNA: DNA coding genes that are actively transcribed (“turned on”) are more loosely packaged and are found associated with RNA polymerases (referred to as euchromatin) while DNA coding inactive genes (“turned off”) are found associated with structural proteins and are more tightly packaged (heterochromatin). Epigenetic chemical modification of the structural proteins in chromatin also alter the local chromatin structure, in particular, chemical modifications of histone proteins by methylation and acetylation. As the cell prepares to divide, i.e. enters mitosis or meiosis, the chromatin packages more tightly to facilitate segregation of the chromosomes during anaphase. During this stage of the cell cycle, this makes the individual chromosomes in many cells visible by optical microscope. DNA wraps around histone proteins forming nucleosomes; the “beads on a string” structure (euchromatin). Multiple histones wrap into a 30 nm fiber consisting of nucleosome arrays in their most compact form (heterochromatin). Higher-level DNA packaging of the 30 nm fiber into the metaphase chromosome (during mitosis and meiosis). There are, however, many cells which do not follow this organization. For example spermatozoa and avian red blood cells have more tightly packed chromatin than most eukaryotic cells and trypanosomatid protozoa do not condense their chromatin into visible chromosomes for mitosis. The structure of chromatin during inter-phase is optimized to allow easy access of transcription and DNA repair factors to the DNA while compacting the DNA into the nucleus. The structure varies depending on the access required to the DNA. Genes that require regular access by RNA polymerase require the looser structure provided by euchromatin. Chromatin undergoes various forms of change in its structure. Histone proteins, the foundation blocks of chromatin, are modified by various post-translational modification to alter DNA packing. Acetylation results in the loosening of chromatin and lends itself to replication and transcription. When certain residues are methylated they hold DNA together strongly and restrict access to various enzymes. A recent study showed that there is a bivalent structure present in the chromatin: methylated lysine residues at location 4 and 27 on histone 3. It is thought that this may be involved in development; there is more methylation of lysine 27 in embryonic cells than in differentiated cells, whereas lysine 4 methylation positively regulates transcription by recruiting nucleosome remodeling enzymes and histone acetylases. Polycomb-group proteins play a role in regulating genes through modulation of chromatin structure. The vast majority of DNA within the cell is the normal DNA structure. 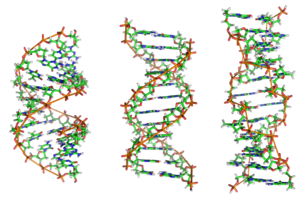 However in nature DNA can form three structures, A-, B- and Z-DNA. 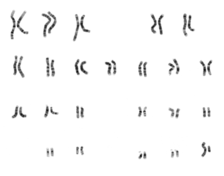 A and B chromosomes are very similar, forming right-handed helices, while Z-DNA is a more unusual left-handed helix with a zig-zag phosphate backbone. Z-DNA is thought to play a specific role in chromatin structure and transcription because of the properties of the junction between B- and Z-DNA. At the junction of B- and Z-DNA one pair of bases is flipped out from normal bonding. These play a dual role of a site of recognition by many proteins and as a sink for torsional stress from RNA polymerase or nucleosome binding. The basic repeat element of chromatin is the nucleosome, interconnected by sections of linker DNA, a far shorter arrangement than pure DNA in solution. In addition to the core histones, there is the linker histone, H1, which contacts the exit/entry of the DNA strand on the nucleosome. 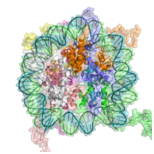 The nucleosome core particle, together with histone H1, is known as a chromatosome. Nucleosomes, with about 20 to 60 base pairs of linker DNA, can form, under non-physiological conditions, an approximately 10nm “beads-on-a-string” fiber. The nucleosomes bind DNA non-specifically, as required by their function in general DNA packaging. There are, however, large DNA sequence preferences that govern nucleosome positioning. This is due primarily to the varying physical properties of different DNA sequences: For instance, adenosine and thymine are more favorably compressed into the inner minor grooves. This means nucleosomes can bind preferentially at one position approximately every 10 base pairs (the helical repeat of DNA)- where the DNA is rotated to maximize the number of A and T bases that will lie in the inner minor groove. Two proposed structures of the 30nm chromatin filament. Left: 1 start helix “solenoid” structure. 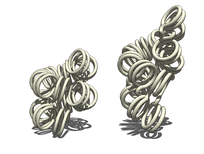 Right: 2 starts loose helix structure. Note: the histones are omitted in this diagram – only the DNA is shown. With the addition of H1, the “beads-on-a-string” structure in turn coils into a 30 nm diameter helical structure known as the 30 nm fibre or filament. The precise structure of the chromatin fibre in the cell is not known in detail, and there is still some debate over this. This level of chromatin structure is thought to be the form of euchromatin, which contains actively transcribed genes. EM studies have demonstrated that the 30 nm fibre is highly dynamic such that it unfolds into a 10 nm fiber (“beads-on-a-string”) structure when transversed by an RNA polymerase engaged in transcription. 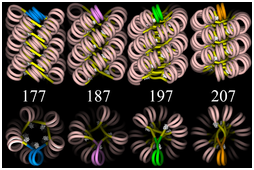 Four proposed structures of the 30 nm chromatin filament for DNA repeat length per nucleosomes ranging from 177 to 207 bp. Linker DNA in yellow and nucleosomal DNA in pink. The existing models commonly accept that the nucleosomes lie perpendicular to the axis of the fibre, with linker histones arranged internally. A stable 30 nm fibre relies on the regular positioning of nucleosomes along DNA. Linker DNA is relatively resistant to bending and rotation. This makes the length of linker DNA critical to the stability of the fibre, requiring nucleosomes to be separated by lengths that permit rotation and folding into the required orientation without excessive stress to the DNA. In this view, different length of the linker DNA should produce different folding topologies of the chromatin fiber. Recent theoretical work, based on electron-microscopy images of reconstituted fibers support this view. The layout of the genome within the nucleus is not random – specific regions of the genome have a tendency to be found in certain spaces. Specific regions of the chromatin are enriched at the nuclear membrane, while other regions are bound together by protein complexes. The layout of this is not, however, well-characterized apart from the compaction of one of the two X-chromosomes in mammalian females into the Barr body. This serves the role of permanently deactivating these genes, which prevents females from getting a ‘double dose’ relative to males. The extent to which the inactive X is actually compacted is a matter of some controversy. Fluctuations between open and closed chromatin may contribute discontinuity of transcription or transcriptional bursting. Other factors are probably involved, such as the association and dissociation of transcription factor complexes with chromatin. The phenomenon, as opposed to simple probabilistic models of transcription, can account for the high variability in gene expression occurring between cells in isogenic populations. Karyogram of human male using Giemsa staining, showing the classic metaphase chromatin structure. The metaphase structure of chromatin differs vastly to that of interphase. It is optimized for physical strength and manageability, forming the classic chromosome structure seen in karyotypes. The structure of the condensed chromosome is thought to be loops of 30 nm fibre to a central scaffold of proteins. It is, however, not well characterized. The physical strength of chromatin is vital for this stage of the division to prevent shear damage to the DNA as the daughter chromosomes are separated. To maximize strength the composition of the chromatin changes as it approaches the centromere, primarily through alternative histone H1 analogs. It should also be noted that, during mitosis, while most of the chromatin is tightly compacted, there are small regions that are not as tightly compacted. These regions often correspond to promoter regions of genes that were active in that cell type prior to entry into cro-mitosis. The lack of compaction of these regions is called bookmarking, which is an epigenetic mechanism believed to be important for transmitting to daughter cells the “memory” of which genes were active prior to entry into mitosis. This bookmarking mechanism is needed to help transmit this memory because transcription ceases during mitosis.